Joanne Mae Postma (Hiemstra), age 86, of Byron Center, peacefully entered Heaven and into the arms of Jesus, our Lord and Savior on Thursday, December 20, 2018. 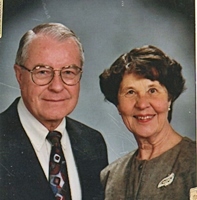 She will be deeply missed by her husband of 67 years, Al; her children, David (Laurie) Postma, Thomas (Tammi) Postma, Lauri (Roger) Dygert, Susan (Todd) Boorsma; 16 grandchildren; 28 great grandchildren; brother and sisters, Russell (Helen) Hiemstra, Sharon and Sharol Hiemstra; brothers-in-law and sisters-in-law, Jake (Lois) Postma, Harold Postma, Gertrude Prins, and Theresa Postma. The family will greet visitors on Wednesday, December 26, from 4 - 7 and Thursday, December 27 from 10 - 11 am at Stroo Funeral Home, where the funeral will begin at 11 am. Mr. Jack Holwerda will officiate. Interment will be in Chapel Hill Memorial Gardens. Contributions in memory of Joanne may be made to Samaritan's Carriage.